The first time you hear the PreSonus Sceptre S6 CoActual 2-way studio monitor, you'll discover fine nuances of your music that can't be reproduced by conventional designs. The Sceptre's panoramic soundstage, fine detail, and stunning dynamics will astonish you. This exceptional performance is the result of an advanced coaxial design that works integrally with a 32-bit processor running Fulcrum Acoustic's TQ Temporal Equalization Technology. The sceptre is the age-old symbol of royal authority. The Sceptre S6 studio monitor provides sound quality and control worthy of the highest levels of aristocracy -- but they're priced for the bourgeois project-studio owner. Each Sceptre monitor contains a DSP chip that enables the use of Fulcrum Acoustic's TQ algorithms. The processor is used to manage horn reflection, linear time and amplitude anomalies correction, performance contouring, and dynamic and excursion limiting. The result is coaxial speakers that perform far better than all but the most expensive studio monitors. In addition to making possible the Sceptre's coaxial design, the monitor's onboard DSP provides user-adjustable contour features for optimizing the monitors for your mixing space. This enables full integration into any studio environment. A four-position Acoustic Space switch controls a second-order shelving filter centered at 100 Hz, with four attenuation settings (no attenuation, -1.5 dB, -3 dB, and -6 dB) so that you can account for the boundary bass boost that occurs when the monitor is placed near a wall or corner. If you don't want to roll off those lows, set it to 0 dB. You also can adjust the Sceptre's overall sound and response using its performance controls. A sensitivity control that ranges from +4 dBu to -10 dBV helps you match the Sceptres to your mixer's outputs. The High-Frequency Driver Adjust switch adjusts the tweeter's overall level to linear (0 dB), +1 dB, -1.5 dB, or -4 dB. This lets you control the balance between the tweeter's output and that of the mid/low driver. The High Pass switch rolls off the low frequencies below the specified frequency (60, 80, or 100 Hz) at a slope of -24 dB/octave. This control is important if you are using a subwoofer in conjunction with the Sceptre S6 monitor; in that case, set it to the same frequency as the crossover to the subwoofer. If you're not using a subwoofer, you simply set the control to Flat. Overall: These monitors are well matched, and the frequency response is nearly flat. The coaxial design is so well done, that you don't hear the speaker, just the music. Yes that sounds like a sales pitch, but it's true. 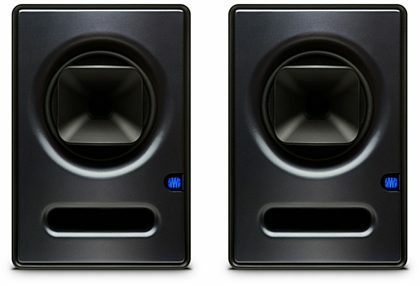 They are some of the only monitors I've heard that reproduce the front edge of transients- They are so damn fast, and responsive that you will hear distortion in songs where you never knew they was any. The downside of all this speed, is that they don't carry a ton of heft. Bottom is clear, tight and accurate enough for all mixing tasks once you learn how they present bottom information. I added a sub eventually, but surprisingly the biggest benefit of that was being able to engage the low cut switch. Once everything under 100hz was cut these things turned into laser beams. No joke, the accuracy got even better and transient info even sharper;deeper. Awesome set for the price.